Vancouver, British Columbia, Canada (November 9, 2009) – Rocky Mountaineer, Canada’s internationally renowned rail experience, has been honoured with a World Travel Award in the category of “World’s Leading Travel Experience by Train” for the fourth year. The World Travel Awards are highly regarded in the global travel network and have been described by the Wall Street Journal as the ‘Oscars’ of the tourism industry. Every year, hundreds of thousands of travel professionals from across the globe cast their votes to determine the winners. Rocky Mountaineer representatives attended this year’s 16th annual World Travel Awards gala event in London, England on November 8, 2009 along with over a thousand international travel and tourism officials. Fellow nominees for the “World’s Leading Travel Experience by Train” award included: The Blue Train (South Africa), Rovos Rail (South Africa), The Royal Scotsman (Scotland), Venice-Simplon Orient Express (Europe), Eastern & Oriental Express (South East Asia), The Ghan (Australia), Hiram-Bingham Express (Peru), The Golden Chariot Train (India) and The Indian Maharaja (India). The World Travel Awards were established in 1993 to acknowledge and recognize excellence in the world’s travel and tourism industry. Now celebrating its 16th anniversary, the awards are considered the very highest achievement that a travel provider could ever hope to receive. Votes are cast globally by fellow industry professionals in 919 different categories with 3600 nominees. This year’s winners were determined by thousands of travel professionals from 183,000 travel agencies, tour and transport companies and tourism organizations in over 160 countries. Rocky Mountaineer offers unique Canadian vacation packages and four spectacular rail routes through British Columbia and Alberta. Best known for the internationally-acclaimed Rocky Mountaineer train, a two-day, all daylight rail journey through Canada’s West and the Canadian Rockies, the company also offers a three-hour experience between North Vancouver and Whistler, BC. Since its inception in 1990, Rocky Mountaineer has grown to become the largest privately owned passenger rail service in North America and welcomed its one millionth guest in 2008. 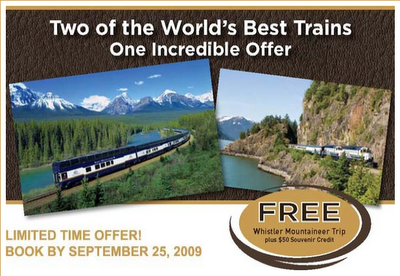 In 2009, Rocky Mountaineer was named one of the “World’s Greatest Trips” by National Geographic and ranked as the number one train experience in the world by The Society of American Travel Writers. FRI AUG 14 – Arrive Vancouver. Overnight Vancouver. SAT AUG 15 – Vancouver City Tour – AM. Overnight Vancouver. SUN AUG 16 – Victoria Day Trip from Vancouver. Full day. Overnight Vancouver. MON AUG 17 – Explore Vancouver on your own. Overnight Vancouver. TUE AUG 18 – Vancouver to Kamloops onboard the Rocky Mountaineer. Overnight Kamloops. WED AUG 19 – Rocky Mountaineer to Jasper. Overnight Jasper. THU AUG 20 – Maligne Valley Sightseeing and Boat Cruise. 5-6 hours. Overnight Jasper. FRI AUG 21 – Jasper to Banff along spectacular Icefields Parkway. Snowcoach onto Athabasca Glacier included. Overnight Banff. SAT AUG 22 – Banff Sightseeing Trip – AM / Lake Louise & Moraine Lake Sightseeing Trip – PM. Overnight Banff. SUN AUG 23 – Depart to Calgary Airport YYC on scheduled airport shuttle. Total Discounted Package Price for 2 Adults = CDN$4,786 ($2,393 per person). This rate includes ALL taxes, promotions and discounts. Upgrade to GoldLeaf service on the Rocky Mountaineer for CDN$930 per person. We have VERY LIMITED SEATS AVAILABLE ON THE ROCKY MOUNTAINEER® so please CONTACT US immediately if you would like to book this holiday package. WED AUG 19 – Arrives Jasper 16:00. Overnight Jasper. Total Discounted Package Price for 2 Adults = CDN$3,186 ($1,593 per person). This rate includes ALL taxes, promotions and discounts. Please note that rates are subject to change. We accept Visa, MasterCard and American Express for payment. 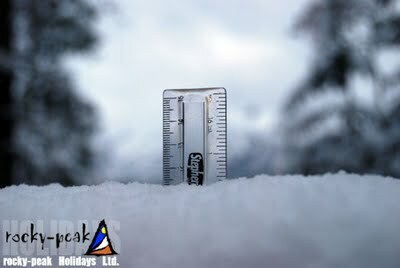 We have a long-term lease available for a one-bedroom unit in Whistler starting November 1 2009. It is located in the Marquise building with ski-in/ski-out close by. If you are interested, please contact rocky-peak Ski Holidays.